Clubkultur is a Box To Box series exploring the true essence of the beautiful game, a look at the intangible feelings that keep us coming back to support our club, no matter how they’re playing, no matter where. In Clubkultur, we will explore the important cultural aspects of football clubs from all over the world, as our contributors see them. 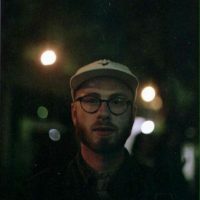 Clubkultur looks at the things that make a club stand out, going beyond their on-field achievements and into the culture that develops around them – rising from geography, politics, religion, economic status and so forth. Seeing the outpouring of raw passion from Naples recently after the club managed to beat league-leaders Juventus 1-0 with a late goal to bring them within 1 point of their first title in nearly 30 years, illustrates that Società Sportiva Calcio Napoli are something of a footballing anomaly. The celebration, usually reserved for a club winning a major title, was a social-media storm amongst footballing aficionados. The club blend that rare and ephemeral ‘cool’ that evades most for their entire existence, yet it is something that has defined the Neapolitan club for a very long time. By playing innovative and attractive football, hailing from an enigmatic city with dualistic tendencies and having a fair claim to football’s most stylish kits – the club are almost untouched as one of football’s most important and interesting. Nothing about Naples is simple to define, as Sophia Loren famously said of her childhood home, “I am from Naples so I like the mixture of drama and comedy altogether.” It seems that this dichotomy permeates everything that happens there. Things will only be funny for a while, the tragic twist looms imminent – the same can be said of life emerging from tragic circumstance. Nothing is settled, it’s a life in flux presided over by Europe’s only active mainland volcano – Mount Vesuvius. The relationship between Naples and the rest of Italy is complicated. The city has endured lazy stereotyping and contemptuous attitudes, bestowing them a regional identity that is perhaps stronger than anywhere else in the country. Shared suffering is one of the most powerful conditions of identity after all. It’s the cunning and energetic yang to Milan’s cool and sophisticated yin. Navigating the streets is to participate in an involuntary dance dictated by the eternal rhythm of cars and bars and the lyrics of the local tongue. 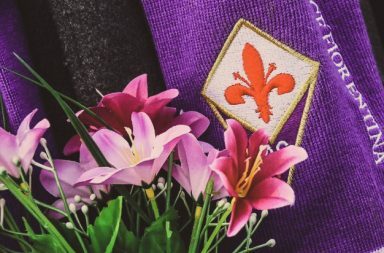 Club and city have developed symbiotically – it was roughneck sailors from England that brought football over with them, establishing a football and cricket team in the scorched Mediterranean climes of Southern Italy. Initially, the top league of Italian football was reserved for the more prosperous industrial north – leaving Napoli to play other teams made up of rival sailors. In the early 1930s, they were admitted into the Divizione Nazionale – the Serie A’s predecessor. The Partenopei’s form was erratic. They were relegated, then promoted, won cups and suffered bribery charges – they endured tumultuous times. Things stabilised in the mid-60s through to the 80s with Napoli being widely considered to be amongst the country’s top four. Relative success in European competition, domestic stability and another Coppa Italia meant that Napoli were no longer Southern underdogs. In 1983 though, the club slid. They were involved in a relegation battle and required a change in fortune. Neapolitan life gravitates around Mount Vesuvius. It’s a permanent reminder– billowing fiery death, looming above the city’s flat skyline, bursting from the earth’s crust like an irritated bite – the city folk are beholden to its temper. Vesuvius isn’t the most giant thing to preside over the city though. This giant came in physically diminutive form from Barcelona in 1984 for a fee of €12 million. Diego Maradona was already a star, but not yet a legend. He was loved upon his arrival – he was a rascal in a city full of them. Every mother from Napoli saw him as their rogueish son, the boys admired his calcio skills and the girls were drawn by his uniquely devastating aura. He was already a child of the city before he had kicked a ball there. His effect was like a drug, he was a way for the hopelessly impoverished to forget their daily toils – he showed them an otherworldly existence that drew from them the unapologetic reverence previously reserved only for the Virgin Mary. Success was initially a process, it took Napoli a couple of years to synchronise with the little Argentinian, but when it came it was a miracle. Their stars aligned in the 86/87 season – still the club’s most successful. The club won their first Scudetto and in true Maradona fashion, made it a double. Beating Atalanta 4-0 in the final of the Coppa Italia brought home two pieces of silverware. Maradonna was sat on the collective shoulders of the city – his scruffy hair breached the clouds that even Vesuvius couldn’t reach. This anomalous season would only signal the beginning though. As runners-up the following season, they were granted entry to the 89-90 UEFA Cup where they bobbed and weaved their way past Juventus, Bayern Munich and PAOK before a narrow victory over VfB Stuttgart in the final. They built on this with another Scudetto victory the following year – their very last. That summer was another important year for Italy and Argentina. It was Italia 90 – the World Cup that was worth a lot more than just the eternal lightness that victory brings. Maradona had prompted fans of Napoli not to cheer for Italy, stating that “I don’t like the fact that now everybody is asking Neapolitans to be Italian and to support their national team. 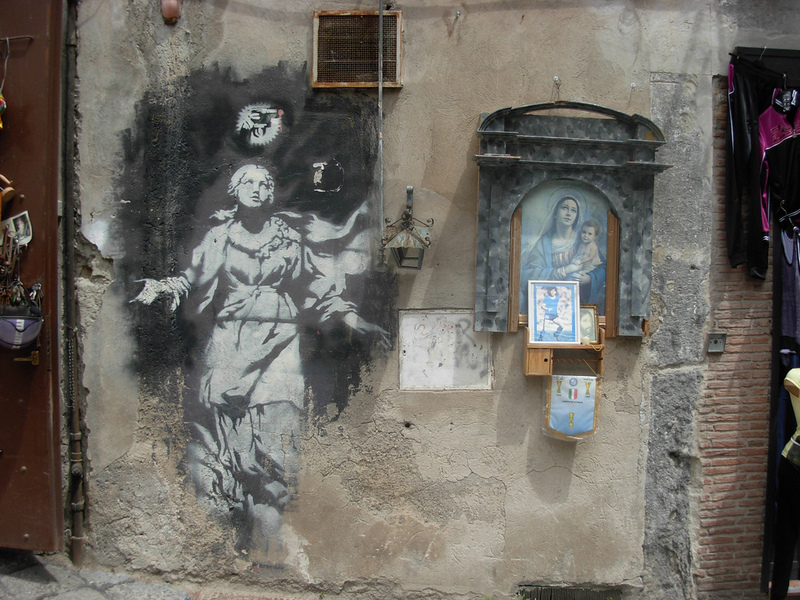 Naples has always been marginalised by the rest of Italy. 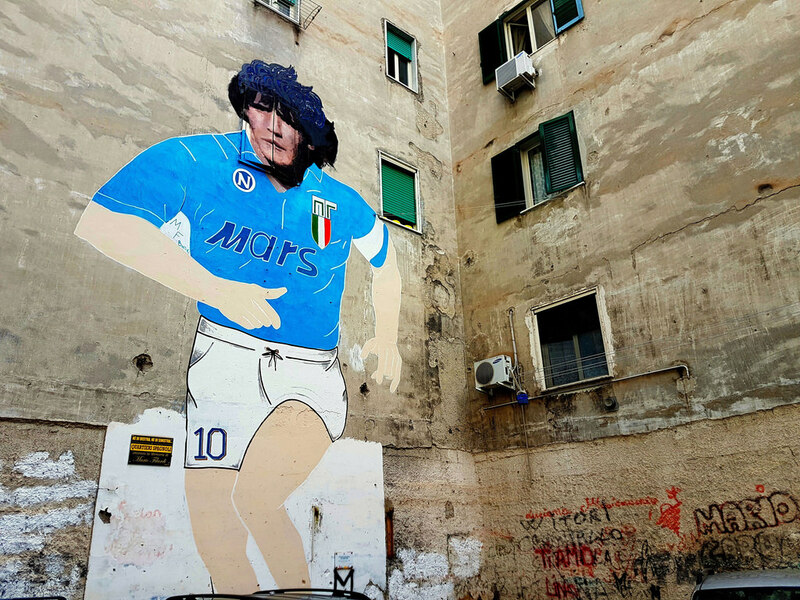 It is a city that suffers the most unfair racism.” By playing into the city’s innate sense of disillusion over their perception in Italy, Maradona urged the fans to eschew their national side – to him Naples was never really a part of Italy anyway. Argentina made it through to the semi-finals against Italy. Where else could it have been held but in Naple’s Stadio San Paolo? Banners held aloft read ‘Diego in our hearts, Italy in our songs’ and ‘Maradona, Naples loves you but Italy is our homeland’. This humbled Maradona – his national team were even applauded by the Italian fans. The respect was mutual. Maradona’s upbringing had placed value on traits like loyalty. One can only imagine that deep inside he’d have seen their unequivocal support of Argentina as something of a betrayal. He had their adoration and that was enough. In the final, Argentina lost. That would not be the final heartbreak for the King of Naples though. FIFA enforced a drug-test which he failed. Testing positive for cocaine meant a 15-month footballing ban and meant that he’d played his last game ever for Napoli. There were tears, but no official goodbyes. 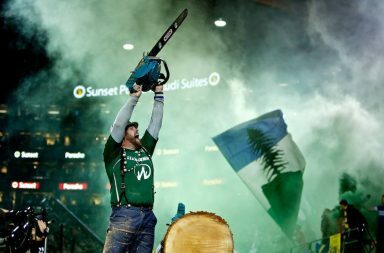 Typically unpredictable, it seemed like the only suitable ending for such an unorthodox chapter of football. Napoli suffered in the years after his departure, almost facing death in 2004. After accruing substantial debt, the club were relegated to Serie C and temporarily changed their name. It was a devastating blow to the one-club city. Although they have since recovered, the spectre of Maradona loomed over the sky blue team from the sweltering south. Fans seemed desperate for a Second Coming. It may have arrived under their noses though, only it isn’t a player. Chain-smoking ex-banker Maurizio Sarri joined from Empoli in 2015. Maradona did not approve, criticising the manager over his early struggle to find form, “The two points from three games seems to be deserved. This Napoli team doesn’t have a good style of play, or a defence that offers the peace of mind to be able to dream big. 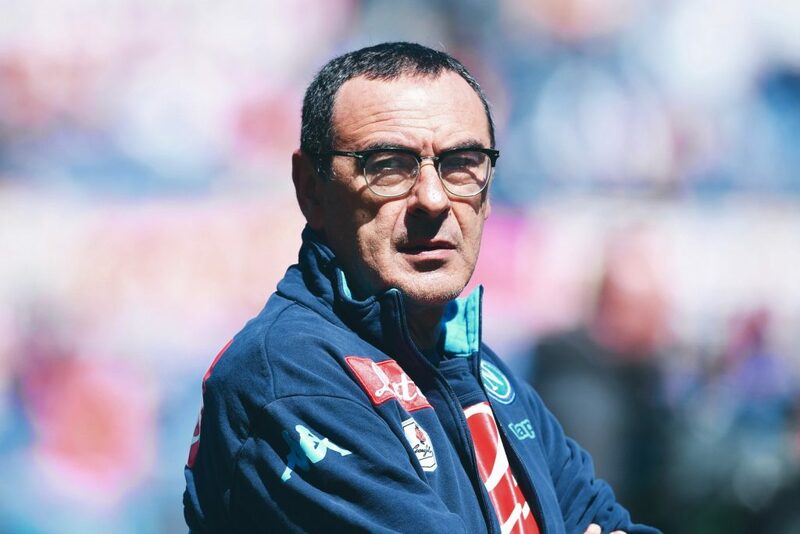 This Napoli will struggle to finish in mid-table, I’m angry because they didn’t deserve this downsizing.” It’s with a hint of irony that Sarri has turned Napoli into one of the most exciting high-pressing and attack-minded teams in European football. His style, dubbed ‘Sarriball’ is bold, brave and aggressive, yielding an unpredictability in attack that would have suited a certain Argentinian. Being a boyhood fan of the club, it’s easy to imagine that the pressure would have been too much for him, but his obsessive footballing nature has built Napoli into one of the most enthralling teams in the world yet again. Sarrismo is the next phase of European football, the successor of tiki-taka – its tactics based are around the standard 4-3-3 and built with confident players who are as committed as their gaffer to playing attack-minded football. A lot of their goals have gone viral. The quick passages of triangle-passing has endeared them to fans. The intense and fluid football looks exhausting – the players cannot switch off at any time. Sarri’s employment of drones in training for later analysis and his commitment to strengthen a team internally rather than making signings are quirks that make him one for the purists. Napoli’s football is the perfect illustration of chaos and order – they have strength at the back, well-drilled set-pieces and a tactical maestro manager that star defender Kalidou Koulibaly says has a “new vision of football”. Yet, they remain unpredictable and able to launch a furious attack at the drop of a hat with devastating speed and efficiency. Their play now, just like their manager, is a philosophical extension to the city’s beloved D10S (the amalgamation of Diego 10 and the Italian word for God, Dios). While the link between Sarri and Maradona might have seemed tenuous, as if the nonchalant tracksuit-clad smoker didn’t come across as enough of a freethinker, he was recently pictured in the team bus with his middle-finger stuck out at Juventus fans that had hurled anti-Neapolitan abuse at Sarri and his team. He’s a local boy so it struck a nerve, that’s nothing to be ashamed of. But it’s now clear to see that the two men’s conviction lay deeply intertwined – lifting the Scudetto this year will all but seal their fate of immortality. The Italian south or Mezzogiorno was viewed as the languid work-shy part of the country, an anchor to the industrial and cosmopolitan north. It was the northern city’s haughty self-importance that seemed to inspire the young Maradona – his youth in Buenos Aires wasn’t too dissimilar to the life he found in Italy. Likewise, Naples inspires Maurizio Sarri. His quiet contentment at Napoli emits a subtle hint of genius – not quite as full-frontal as Maradona’s, but certainly achingly Neapolitan. Napoli are a unique entity in world football – a direct product of their environment. To those not from Naples, it’s a hard pace of life to adapt to, yet remains scintillatingly romantic to outsiders. We all wanted to be Maradona when we were kids, now we all want to be as cool as Sarri. Sadly, we probably never will and that’s why we love Napoli – they are a reminder that we are able to dream, no matter how imperfect or unreachable those dreams may be. They are a reminder that greatness can manifest from anywhere. Scottish football writer living in Lisbon that covers the sociology, politics and economics behind the beautiful game.